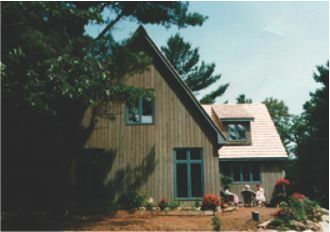 This new home for a music teacher is located on a beautiful wooded lot north of Toronto. After the design was completed Jan Wintjes of Construction Source and I developed the working drawings. The house location was carefully chosen nestled in the mature pine trees to take advantage of the natural beauty of the site. Salvaged wood posts and beams were carefully introduced in the design of the new home to accent the rustic appearance. Tasks included: Survey site, Design and construction drawings, OBC review, Interior design, permit application and construction supervision. 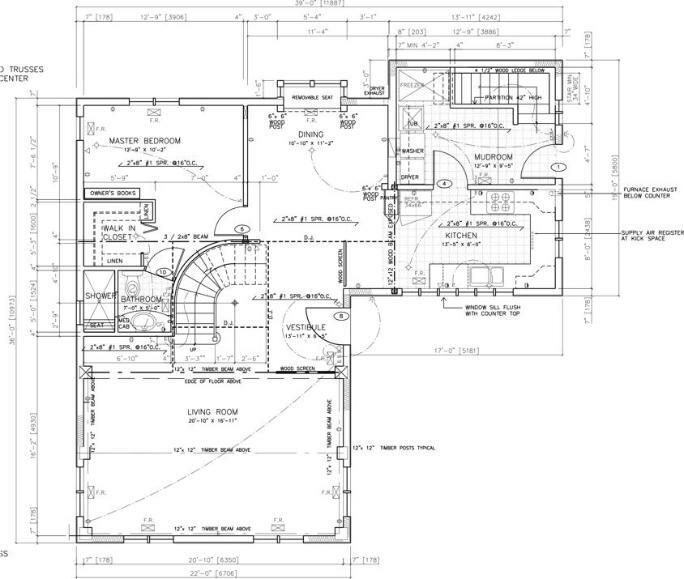 The main floor plan of the house showing the living room with feature curved stair. View towards the dining room showing the curved stairway (unfinished at the time of the photo). 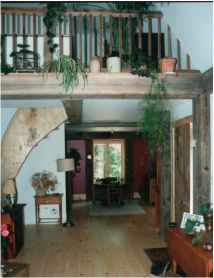 The salvaged wood beams and posts provide structural support for the second floor, the high pitched roof and open cathedral ceiling in the living room.